St Gabriel's Church Warwick Square sits on the south-east corner of St George's Drive and Sussex Street in Pimlico. 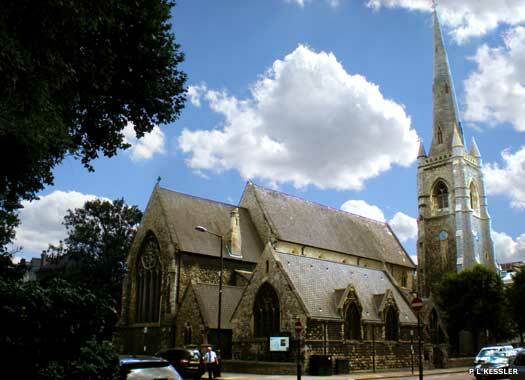 The church was one of those which was built as part of Thomas Cubitt's development of the area on behalf of the marquis of Westminster between 1840-1860. St Saviour's was another such church. 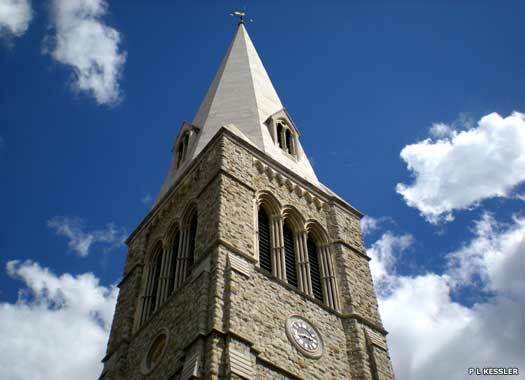 St Gabriel's was built between 1852-1853 in the Gothic style to a design by Thomas Cundy, Cubitt's foreman, using Kentish ragstone with Caen stone dressings. 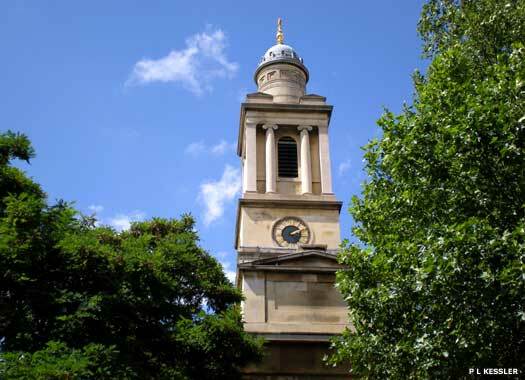 The church gained a parish from part of that of St George, Hanover Square, and was consecrated on 12 May 1853. It is a middle-pointed building with a graceful tower of just under forty-nine metres (160 feet). In 1855 eight bells were fitted. 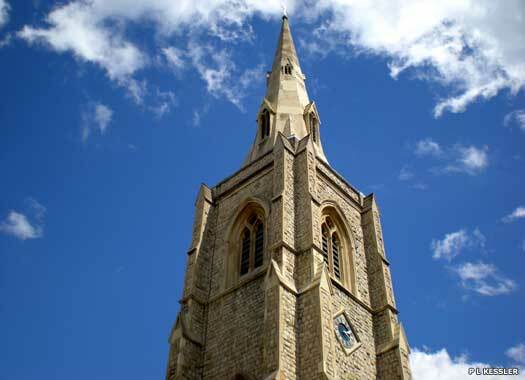 The use of ragstone, which is vulnerable to London's polluted air, meant that the tower started to deteriorate as early as 1887 when, after a falling stone nearly killed a member of the congregation, it had to be taken down and rebuilt. 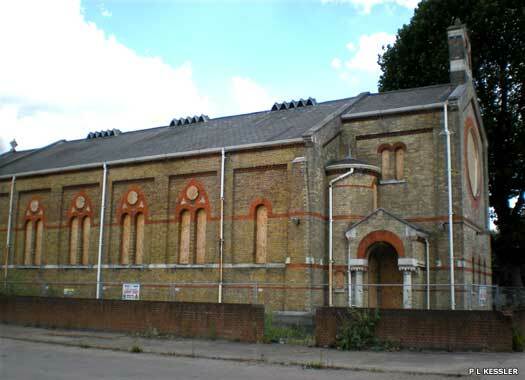 Chelsea Barracks Chapel was part of the barracks site which formerly fronted Chelsea Bridge Road, while the chapel itself looks out onto Ranelagh Grove, at the back of the premises. The chapel was built after the Crimean War, in 1859, part of the 'Italian medieval'-style self-contained military village, to a design by George Morgan. It was deconsecrated in the early 1990s, and by 2010 it was all that remained after the barracks had been bulldozed to make way for housing. 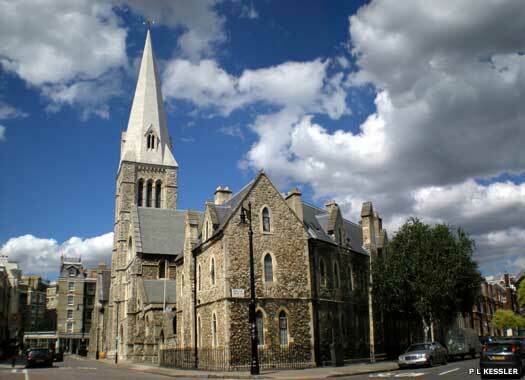 St Barnabas Pimlico is on the south-east corner of Pimlico Road and St Barnabas Street, on the border between Belgravia, Chelsea and Pimlico. 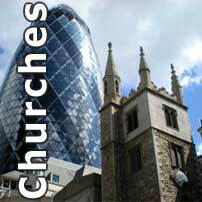 The church was consecrated on St Barnabas' Day in 1850 amid considerable controversy caused by accusations of 'Popery in Pimlico'. Its style is Early English Gothic and the architect was Thomas Cundy. It was the first church built in England where the ideals of the new Anglo-Catholic movement were embodied in its architecture. Inside is the Shrine of St Barnabas, erected as a memorial to the Reverend G C Rawlinson, who served there for nearly twenty years. Four windows of saints associated with Britain by Walter Tower grace the nave. They include St Edward the Confessor, patron saint of Westminster, and St Osmond, the Norman bishop who built the cathedral at Old Sarum. The spire was rebuilt in 2006-2007 after a masonry fall in 2004 and is now of Portland stone instead of softer Caen stone. St Philip Buckingham Palace Road stood about here, on the south-west corner of Buckingham Palace Road and Semley Place. The site, now Belgravia Police Station, is shown from the Edbury Square side, and it seems the most likely spot for the church's location. 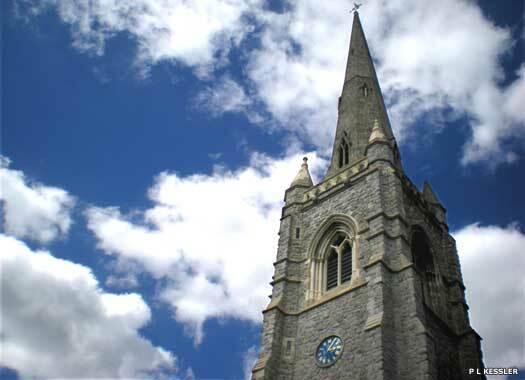 It was consecrated in 1888 and gained its own parish two years later. It was closed due to war damage, probably in 1946, and was demolished in 1953. 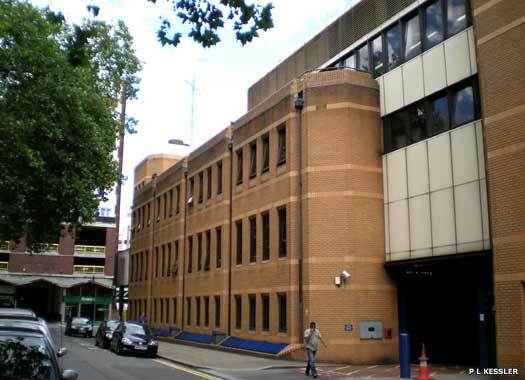 Its parish was united with St Michael Chester Square (below). St Michael Chester Square stands on the north-east corner of Chester Square and Elizabeth Street in Belgravia. The square was planned in 1828 and built from about 1835 as part of Belgravia and Pimlico's Grosvenor Estate. The church was not part of the original scheme. A plan of 1840 marks the area as 'intended mews' for the houses in Elizabeth Street. This is the reason for the unusual shape of the site and the west door opening surprisingly close to the back of houses. The change of plan was probably due to the demolition of the Chapel of the Lock Hospital in Grosvenor Place in 1842, which left the new residents of the area without a place of worship. The architect was Thomas Cundy Junior, and the church, of stock brick faced with Kentish ragstone and Bath stone dressings in decorated Gothic style, was opened in 1846. Thanks to the constricted site, the church is almost square, with a short, three bay nave and a shallow chancel. 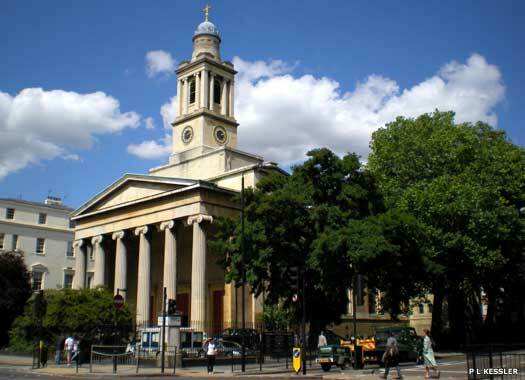 The Parish of St Peter Eaton Square occupies the north-west corner of Upper Belgrave Street and Hobart Place, in the northern part of Belgravia. 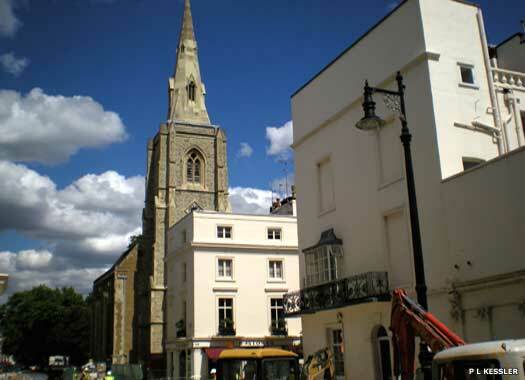 The church was built between 1824-1827 at a time when Eaton Square itself was first being developed. The design was by architect Henry Hakewill in the Classical style. The portico consists of six ionic columns overlooked by a small tower with clock. Inside, the church had a functional preaching box which was typical of the period. The original church burnt down and was rebuilt from the original drawings by one of the sons of the original architect. Sir Arthur Blomfield oversaw its enlargement in 1875, during which the interior was reordered to add a Romanesque chancel at the west end. In 1987, the church was burnt to a shell by an anti-Catholic arsonist who mistook it for a Catholic chapel. Local architects John and Nicki Braithwaite were given the job of completely redesigning and rebuilding the church.